What is the point of Jewish politics today? At the end of the 19th and beginning of the 20th century, when most British Jews arrived as refugees from the pogroms of Czarist Russia, Jewish politics had a very specific dynamic. They were directed against the masters of the sweat shops as represented by the formation of some 30 plus Jewish trade unions. Another ‘friend’ of the Jews was Arthur James Balfour, the Tory Prime Minister who introduced the Aliens Act of 1905 which restricted Jewish immigration. In 1917 he sent a letter, the Balfour Declaration to Lord Rothschild sealing the alliance between the fledgling Zionist movement and British imperialism. Jewish politics until the second world war were about the fight against poverty and anti-Semitism. Only the middle and upper classes were concerned with Zionism. Today that has changed. Virtually no Jews live in London’s East End. Their place has been taken by Bengali immigrants. Jews are no longer the main victims of fascism or racism. Jews do not experience Police violence, deaths in custody or state racism. They do not experience economic discrimination. Jewish politics have changed out of all recognition. 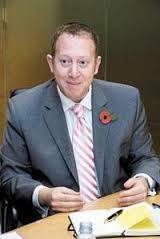 Pick up a copy of the Jewish Chronicle and the main topic of interest revolves around Israel. Jews today serve the purpose of providing an alibi for Israel and its policies. The standard response to campaigns against Israel or Zionism is the charge of ‘anti-Semitism’. Hence why, for two years, even before Jeremy Corbyn was elected as leader of the Labour Party, the Zionist movement has waged an anti-Semitism smear campaign. In August 2015, Corbyn was accused of links with a holocaust denier Paul Eisen. At the forthcoming Labour Party Conference the Jewish Labour Movement will seek to move a Rule Change which will mean that any supporter of Israel can claim to be a ‘victim’ of anti-Semitism if the issue of Palestine is raised. False accusations of ‘anti-Semitism’ have been the principal weapon of the Right in the Labour Party. Supporting Austerity or cutting benefits is unattractive politically. Even supporting the bombing of Syrians and Yemenis isn’t as appealing as opposing ‘anti-Semitism’ and defending Israel’s ‘right to exist’. Cloaking yourself in the mantle of the Holocaust and ‘anti-Semitism’ even though you are supporting a 50 year old military occupation and the Apartheid State of Israel, is seen as offering better political dividends. ‘Anti-Semitism’ is the go to weapon of choice for Labour’s Right. 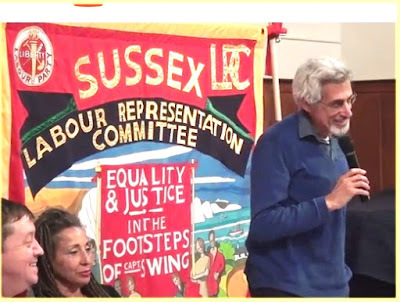 Because the Jewish Labour Movement claims that they represent all Jews in the Labour Party no one doubts that an alternative Jewish organisation is necessary which stands for the principles of anti-racism and support for the Palestinians. That is why any Jewish group worth its salt must be primarily concerned with rebutting the allegation that to support the Palestinians and to oppose Zionism makes one anti-Semitic. Jewish socialists task is to sever the connection between being Jewish and supporting Israel. Unfortunately Jewish Voices for Labour which has just been set up doesn’t want to so much challenge the politics of the JLM as avoid them. Its founding statement of principles completely avoids saying anything about the Right’s ‘anti-Semitism’ smear campaign which has led to the suspension of Ken Livingstone, Jackie Walker, myself and others. Indeed it wants to say as little as possible about Palestine and Zionism. This is not accidental. To discard the shackles and gather with other Jews to explore, celebrate, critique etc our heritage at this juncture without the Israel thing, and in the context of the resurgence and ascendancy in the Labour Party of values that we share in some part because of our Jewishness. If anyone can’t live without the words Israel, Zionism, Palestine, Gaza, BDS (and why not add Occupation, the Wall, administrative detention, land theft, child prisoners, war crimes, apartheid, racism, settlements etc etc) then this is not the organisation for them. So there we have it. What Lever calls ‘the Israel thing’ is part of the ‘shackles’ of being Jewish. Whilst many Jews are active in rejecting a Zionist movement that has linked up with Trump, Orban, Bannon and the alt-Right, Lever and co. prefer to sit around ‘exploring, celebrating, critiquing etc. their heritage’. Quite what they think they will discover is mind boggling because, as Sivanandan explained, identity is what you do and who we are not what you think. But to Lever, Amanda Sebastyen and others, Israel and Zionism is an optional extra. It is a lifestyle choice not a permanent political commitment. Going on a demonstration is a recreational activity. The purpose of a Jewish group in the Labour Party is political or it is nothing. Zionism deliberately conflates being Jewish and being Zionist. Any Jewish group that claims to be socialist has no choice but to challenge the JLM and Labour Friends of Israel. It has a political and moral duty to oppose the actions of those who claim Israel’s war crimes in the name of all Jews. It is interesting that Rachel Lever explicitly rejects the second of her four choices that she articulates in her email viz. 'To spend our lives and energies exposing it [Israel] and campaigning for justice for Palestinians, thus making its negation also an intrinsic part of our identity.' Most of the 'non-Zionist' peace wing of JfJP aren't so explicit in saying what they really believe so we should be grateful to Rachel. 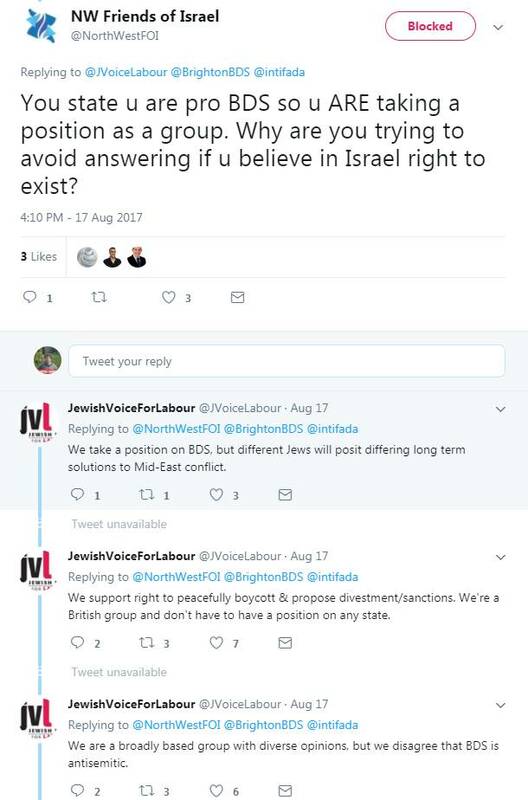 When asked about Israel's 'right to exist' the response was that JVL was a British group and therefore has no position on any state! It has been suggested that we should judge JVL more by what it does than by what its founding principles say. I disagree. What confidence can one have in an organisation that dares not speak its mind, that doesn't openly state what it believes in and which hides its principles behind a bushel? Who does it think it is deceiving? Surely not the JLM. That is dishonest politics. I fully understand why Asa Winstanley of Electronic Intifada, should welcome the formation of JVL, as an alternative non-Zionist Jewish group in the Labour Party. Asa is not alone in wanting to see an alternative to the execrable JLM, the British wing of the racist Israeli Labour Party, and LFI, which is an extension of the Israeli Embassy inside the Labour Party. It is therefore regrettable that JVL has not only been set up undemocratically but a Founding Statement of Principles has been issued which is politically disingenuous. Despite being asked to sign a statement of support for JVL, I was not invited to its inaugural meeting when a founding statement was agreed. Nor were other Jewish anti-Zionists including the International Jewish Anti-Zionist Network. It is clear that those who were instrumental in the formation of this group, in particular Jews for Justice for Palestinians and the Jewish Socialists Group, were determined that JVL would neither be a democratic nor a campaigning group inside the Labour Party on the issue of Palestine and Zionism. In particular they they did not want it to be seen to oppose the JLM’s Zionist agenda. Instead of debating out differences openly, its founders have used administrative methods to exclude potential critics. I issued a statement a week ago Some Comments on the Formation of Jewish Voices for Labour. 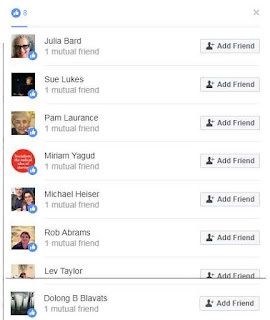 which I sent to members of JVL's Facebook group. I then applied to join the FB group and was accepted. However that didn’t last very long. 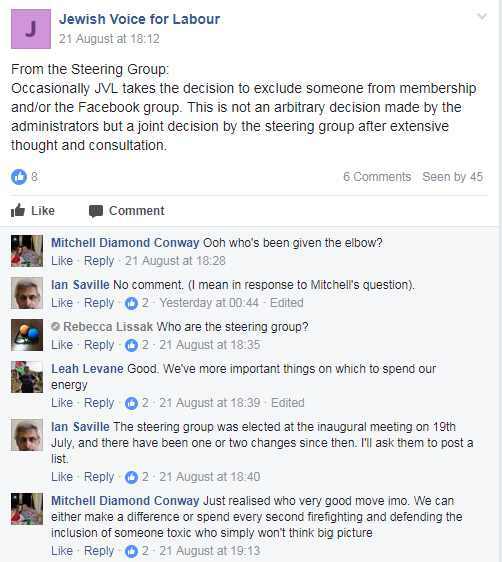 Almost immediately Ian Saville, warned me not to ‘attack’ members of the Steering Committee and in particular not to ‘disparage the process of its formation’. Clearly democracy isn’t one of JVL’s strong points. When I responded to this warning with JVL – What are they scared of? I was removed from the group. 1. JVL’s formation was undemocratic, effectively a stitch-up between leading members of JfJP and JSG. 2. Given that the JLM have been waging a false-anti-Semitism campaign for nearly two years it is unbelievable that JVL have nothing to say about this campaign. 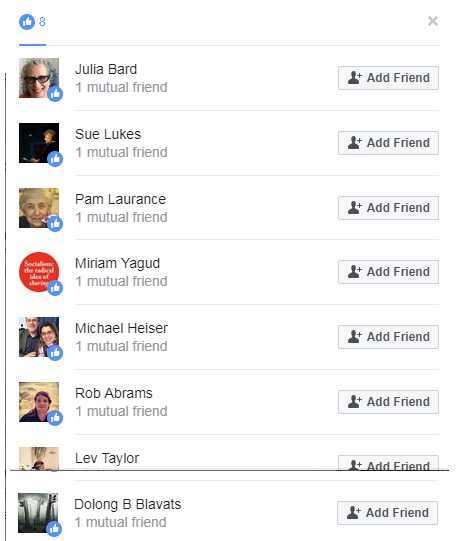 On the JVL FB group, some members of the group were openly calling for support for the expulsion of Livingstone. 3. JVL takes no position on giving concrete support for the Palestinians. It isn’t necessary to take an explicitly anti-Zionist position but when the JLM is saying that even to use the word ‘Zionist’ is abusive it is political cowardice to avoid the word. Zionism is the racist ideology and movement that led to Israel, a Jewish supremacist state. A state which has reduced Gaza to a human rights disaster yet Gaza too is not mentioned. 4. Perhaps the single most important issue in terms of solidarity is the question of BDS. JVL supports the right of others to support BDS however it abstains from supporting BDS itself. Nor does it make any mention of the Palestinian Right of Return. 5. JVL is Jewish only. There is often a good reason for having specific Jewish solidarity groups (e.g. Jews for boycotting Israeli Goods, JfJP etc.) but in terms of the Labour Party it is important to have a common front against Zionist reaction and that must include non-Jews. Ironically even the JLM accept non-Jews. It is a concession to chauvinism to exclude non-Jews from the organisation. 6. The statement makes no mention of the Zionist campaign to redefine anti-Semitism, the International Holocaust Remembrance Alliance definition. When the Zionists are waging campaigns against our very right to campaign on Palestine and smear Palestinian supporters as ‘anti-Semitic’, to pretend this is not happening is unreal. When the Zionists and the Right explicitly link being Jewish and supporting Israel, to refuse to mention Israel or Zionism is not some brilliant political manoeuvre but an act of political cowardice. The Labour Party is not a knitting circle. The idea that the JLM is going to be defeated by this political sleight of hand is wishful thinking. The way to ‘decouple’ anti-Zionism and anti-Semitism is not by pretending the debate doesn’t exist but by engaging in it and politically challenging the supporters of Zionism. Subject: Re: FREE SPEECH AND ISRAEL: A CALL TO LABOUR PARTY MEMBERS Interesting, Rachel. Than the new organisation is devoted to silencing the debate on Palestine? To keeping mum on the anti-Semitism lies and slurs? To avoid speaking on the long list of topic you number? Well, my my, I thought that was the role of JLM, and it was already doing that rather well… So JVL will try to replace JLM in making Palestine and the occupation invisible? Now it is all clear, at last. On 8 Jul 2017, at 23:09, Amanda Sebestyen wrote:I think this sums up the role and importance of JVL beautifully, Rachel. From: Michael Kalmanovitz Sent: 08 July 2017 11:05To: 'Haim Bresheeth'; mailings@jfjfp.comCc: 'Jonathan Rosenhead'; 'Naomi Wimborne-Idrissi'; 'Rachel Lever'; 'Mike Cushman'; 'richard kuper'; 'Amanda Sebestyen'Subject: RE: FREE SPEECH AND ISRAEL: A CALL TO LABOUR PARTY MEMBERS Haim Bresheeth said “three important words have not made their way to this text: Israel, Palestine and Zionism”. May we add two more to his: “Gaza” – which is the best known example of Israel’s slaughter of the innocents; and “BDS” – the massive & growing international non-violent antiracist boycott movement. Are we to assume therefore that these will not be central issues of the group that this letter is proposing to form? Livingstone’s considerable electioneering skills during the campaign.) The election result has slowed down the Zionists/right-wing. Bearing all this in mind, what is your proposed organisation for? If JVL isn’t opposing what the Israeli occupation is doing to Palestinian people, promoting BDS, opposing the Zionist/right-wing’s undermining of the new movement, what else should people organised as Jews within the Labour Party who are not Zionists be forming an organisation to accomplish? Surely JVL will not want to resurrect the antisemitism “discussion”, which is what the Zionist/right-wing wants, taking the focus off defeating the red Tories & the blue. Jewish Voice for Labour (JVL) is a network for all Jews in the Labour party. Our political priorities are universal human rights and dignity; justice for all; freedom of speech and free-thinking; and democracy in the Labour Party. Our mission is to contribute to making the Labour Party an open, democratic and tolerant party, encouraging all ethnic groups and cultures to join and participate freely. As such we aim to strengthen the party in its opposition to all forms of racism including antisemitism, broadening the party’s appeal to all sections of British society. We take our inspiration from the long history of Jewish involvement in the socialist and trade-union movement and in antiracist and antifascist struggles including the civil-rights movement. We stand for rights and justice for Jews everywhere without wrongs and injustice to other people anywhere. At a time of profound divisions in Jewish communities, JVL offers a space to explore and debate the many questions (personal, social, cultural, political) that are important to us as progressive Labour Jews. We aim to create an alternative voice on the left for the Jewish values and heritage we can all be proud of. We will work where appropriate with existing groups concerned with Jewish issues from an internationalist and anti-racist perspective. We will try to arrange a meeting in a couple of weeks time to agree a minimal set of rules, membership fees and to elect such officers as decided then. We will aim to launch publicly at the Labour Party conference in September. How my exclusion was announced to the JVL list - no mention of who is excluded still less the reason why. But as Leah Levane explained there are more important things than democracy. Hello Tony, I am writing to you as one of the administrators of the JVL Facebook Group. Whatever your intention, the effect of your interventions in the group in the short time in which you have belonged to it are likely to have a negative effect on the functioning and perception of the group. The group should be a place where people with a diverse range of opinions can engage in comradely discussion without being attacked or denigrated. Your posts attacking the steering group (of which I am not a member) and other people posting on the page seem provocative and divisive, and have caused concern to other members. If you persist with such posts you will be removed from the group. It seems also that even before joining the group you circulated some of its members with unsolicited material attacking the JVL and disparaging the process of its formation. This has also been a matter of concern to some who received your message. Please take this as a warning and desist from this sort of behaviour, as any further instances will result in you being immediately excluded from the group.